One of our staff, Abi, braving the cold to man our market stall, helping us to spread the word about what we're getting up to. Once a month until June 2016 we will have a stall present at Warwick Market. This will allow everyone to stay abreast of our progress with the Market Hall renovations and to keep updated as to what our plans are ahead of reopening. We will have draft floor plans available, showing what the museum will hopefully look like once the renovations are complete. Additionally, we will also be using this opportunity to highlight this website, and we encourage everyone to get involved and share their thoughts on and memories of the county. 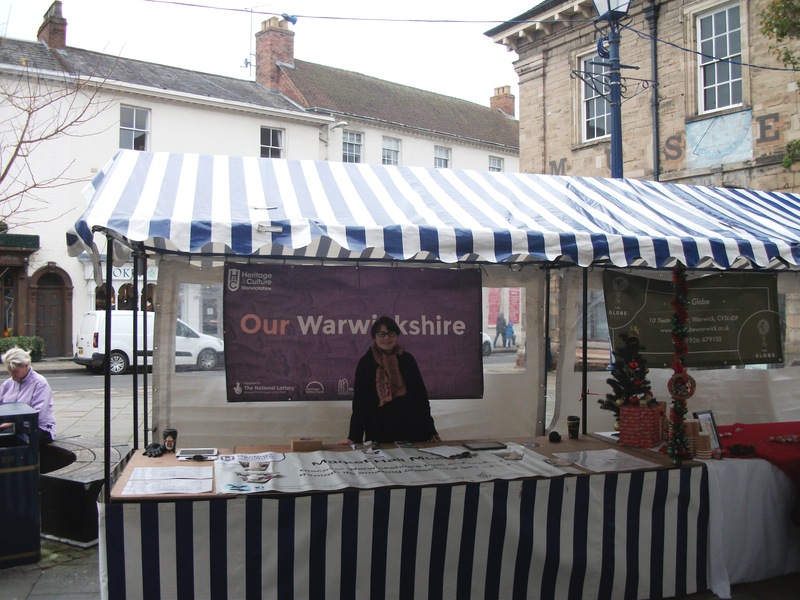 Our stall each month will have a theme, running alongside the Our Warwickshire Project, linked to events happening across the county and the redevelopment of the Market Hall Museum. Some of the themes we will be visiting include the Sheldon Tapestry, opportunities for volunteering with Heritage and Culture Warwickshire, and the access panel, taking place on Disability Access Day1. In addition, we will have a handling box containing objects linked to the three new themes which will form the basis of the museum’s displays – Getting Here, Living Here, and Made Here. If you’re around this Saturday, please stop by to have a chat with our staff; feel free to discuss the Market Hall renovations and this website – we’d love to hear from you! Heritage and Culture Warwickshire is looking for groups that want to find out more about the Our Warwickshire website. We can offer free sessions to groups from January to July 2016, at venues around the county and this will be a chance to see the website, discuss what’s been posted, and find out how to get involved. If your venue has Wi-Fi, or computers, the session can be practical. We can also bring a portable scanner if you have images to add to the site. For more information email Sarah Hann at sarahhann@warwickshire.gov.uk or phone 01926 736422. We’ve also got callouts for both a visual artist and a storyteller for the Our Warwickshire Community Engagement Programme. Please open the attachment on this page to find out more. 1 Developing physical and intellectual access to the museum.